A professional Wall landscaping design will add to your lawns curb appeal as well as adding value to your home. For a custom landscaping design that not only reflects your personal taste but also enhances the appearance your New Jersey property, call the professionals at Lawn Pro. Our expert landscape designers in Wall are extremely creative, experienced and knowledgeable in all aspects of the landscaping industry in New Jersey. We design elegant, and functional landscaping that will blend the natural beauty with the style of your home or business. For your own personal paradise, call or contact Lawn Pro today! Proper landscaping design and principles can result in an outdoor area that is both a sanctuary and structurally sound. Our expert Wall landscapers give customized service to each landscaping job so each one of our clients receives personal attention through the landscaping process, from design to the finished products. Our lawn care experts are highly experienced at examining your home's available space dividing it and repurposing it into specific areas for different purposes. 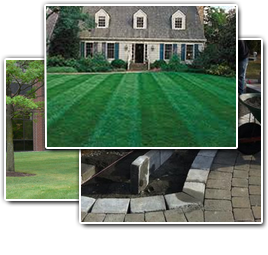 Lawn Pro has been Landscaping New Jersey properties for over 10 years. We provide a 100% guarantee on our work and are committed to using only top quality landscape products.